Ubisoft predicts that in the "not-too-distant future," the Assassin's Creed franchise will grow to be as big as Grand Theft Auto and Halo. Having faith in your product is a good thing, but it's a little too easy sometimes to cross that fine line between optimism and delusion. Has Ubisoft's U.K. marketing chief Murray Pannell gone that far? You decide. "I believe with the success of Assassin's 2 we have now got an opportunity to position ourselves as one of the true triple-A blockbusters," he told Eurogamer. "Are we as big as things like GTA and Halo and things of that nature? Possibly not at this point. But I think we are uniquely poised now as a property, as a franchise, to certainly consider ourselves one of the must-have games whenever a game launches on Assassin's Creed in the franchise." "It's part of our role and responsibility to position it from a consumer point of view as one of those big blockbusters through decent marketing campaigns," he continued. "One thing we've been doing already is advertising Assassin's: Brotherhood on TV this summer, three or four months before launch. That only helps position it in consumers' minds as, 'This is a big game I need to consider as one of the true blockbuster franchises'." 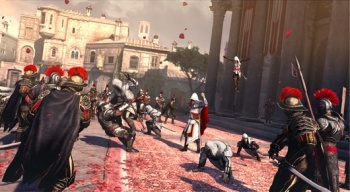 There's no question that Assassin's Creed is an impressive success: Ubisoft announced that Assassin's Creed 2 had sold almost nine million copies as of the end of March 2010. But that same month, Take-Two Interactive revealed that Grand Theft Auto IV had punched out more than 15 million units worldwide. Of course, GTA4 came out a year and a half earlier, so the question becomes whether or not Assassin's Creed 2 has the legs to almost double its sales in its second year of release. Pannell remains, well, optimistic. "To be honest, I'm not sure we're there yet," he said. "But I don't see any reason why we shouldn't get there at some point in the not-too-distant future. That's about longevity and building decent products, properly marketed, and getting the name out there." In case you're wondering, yes, this is the same man who predicted last week that 3D televisions would be "in everyone's living room" within three years. High hopes, it would seem, run strong in his veins.